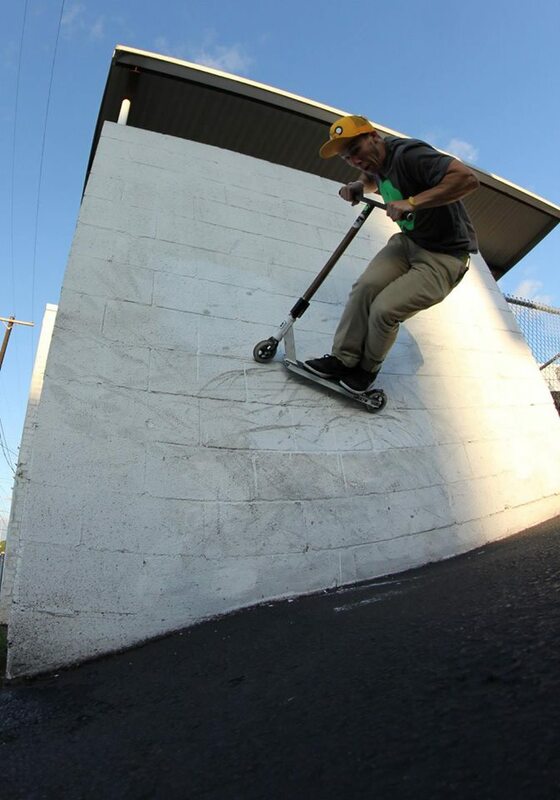 This 6 Sick Tricks features Lucky Scooters title team rider, Jake Charters. Jake has a very unique riding style so I am fascinated to see what kind of tricks he is into. Check this 6 Sick Tricks with Jake Charters out and enjoy! 1-frontboards because when you get on one right, you get locked and can ride it out to death if need be. 2- indie air, with a good blast and a little poke you can make one of the most simple tricks into something gnarly. 3-cannonball, if its done right you can make it look just like a moto cannonball and even if its small you have to be floating up high to land them. 4- any high air,anything over 3 feet is good to me any bigger and it just gets more fun. I used to be amazed with all the riders like Stan Smirnoff who could just blast quarters and bowls with out a problem and now i can finally keep up with them. 5-360 whip, wether its going down, up or even flat they are by far the nicest feeling spin trick out there. 6- carving a nice pool or deep bowl hitting all the pockets and slashing, blasting all the possible spots and hips, like riding a wave or riding a snowboard, everything just flows and is amazing.